I’ve been a bit absent from the old blog this week due to having a small piece of wood in my eye. I quite literally poked myself in the eye with a stick. Well a piece of kindling actually but the upshot was the same. Ouch. Despite me doing a thoroughly convincing impression of a pirate for a couple of days we have rediscovered our arty mojo here at Chez Jhompson and the boys have been arting up a storm over the last couple of days. 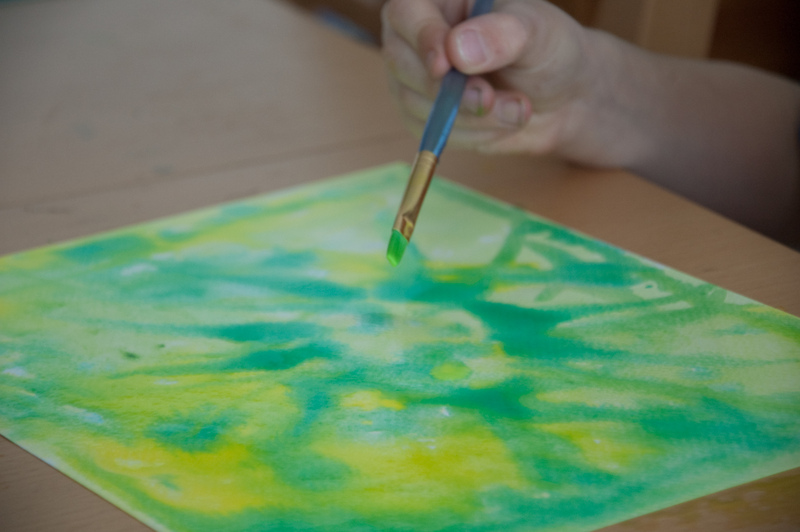 We indulged in a bit of wet-on-wet watercolour painting, exploring spring colours of differing yellows and greens. I love how gentle this kind of art is, allowing for free interpretation. Huwyl’s sense of focus and purpose with his art has definitely changed over recent months. He has a clearer idea of what his goal is and is willing to spend more time and care in order to achieve it, it is lovely to see him so immersed. 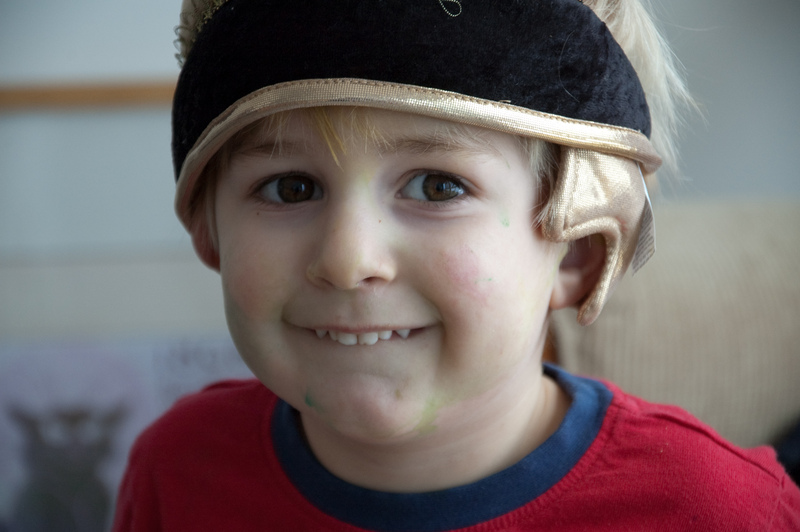 Neirin is, of course, not able to stay on task for as long but he definitely enjoys all of our art experiences and still finds time for a little dress up. 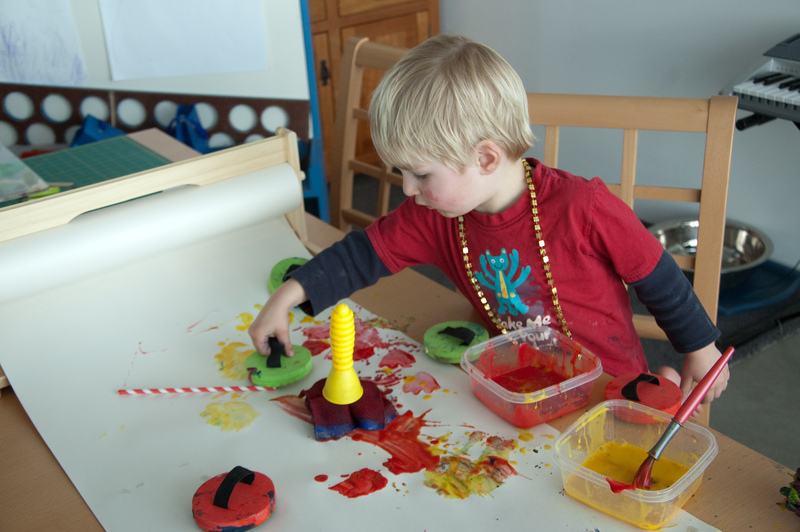 Neirin is in a much more sensorial developmental stage, he is experiencing things much more through his body and senses than his eyes, it is really fun to watch him dive in, uninhibited to a box of art tools and some paint. 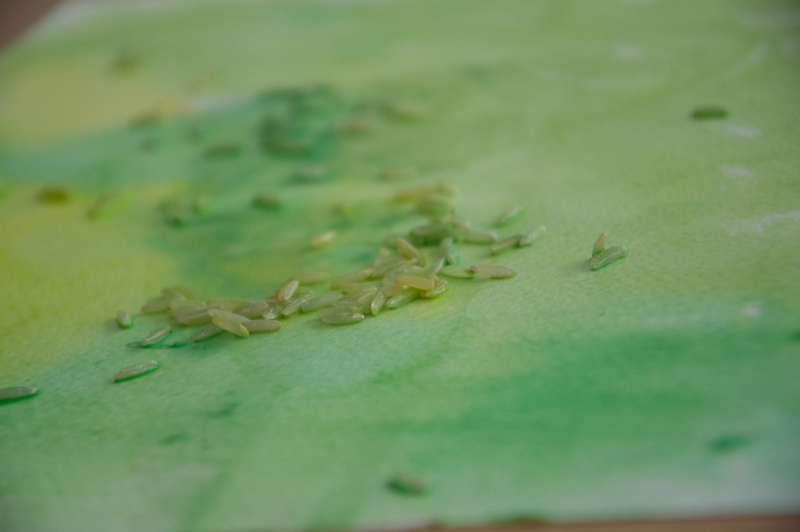 He also really enjoyed scattering rice on his watercolour painting, though there was a bit more dumping and spreading than I had anticipated. Note to self, never leave the room when there is a tub of rice on the table. Never. I’ve been using my Pinterest Art Board to log ideas for art projects (and everything else), I find it such a wonderful resource for ideas. Even if we only use it as a jumping off point it is great encouragement to try new things, to experiment and see what happens. So what was it that inspired all of this creativity? What triggered this attack of arty mojo? Tada! The most fantabulous set of shelves in the entire world! * Yes indeedykins these puppies have literally changed my life. 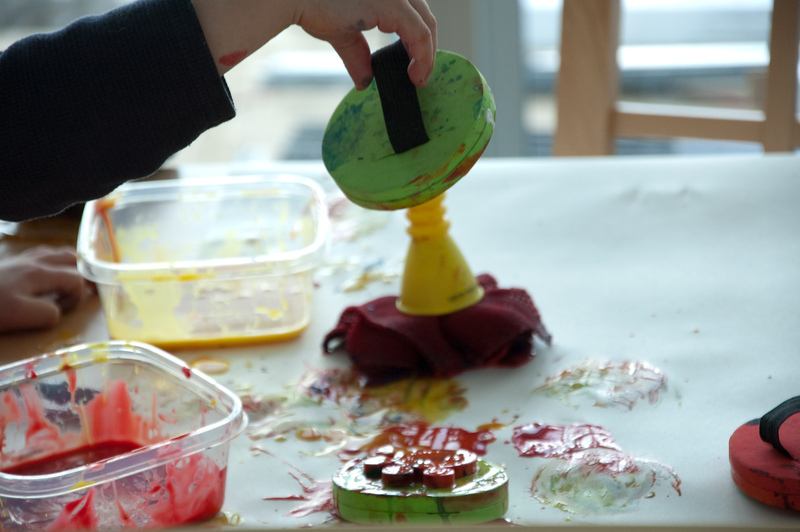 No more art supplies scattered everywhere, toys with no home, games forgotten and out of sight. Now it is all front and centre, triggering my creative thoughts as I see the supplies available and think hmmmm, what could we do with that? 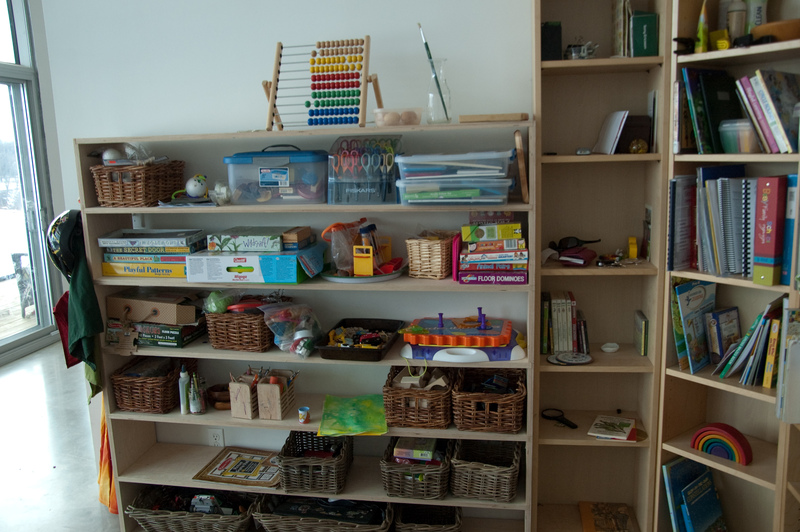 As well as having a tidier house, I feel much more able to create interesting projects at a moment’s notice and I know that the boys will actually be able to use their toys as I present them with different baskets of nicely grouped items for their creative fun. Adore. Stephen knocked these up for me as phase once of my Organise My Stuff plan. Ok, the title could use some work but the idea is sound. Apparently this was his first router project, when he told me this I nodded as though that meant something to me but quickly moved on to the topic that really interested me, baskets. I got these onces from ikea and they work perfectly. 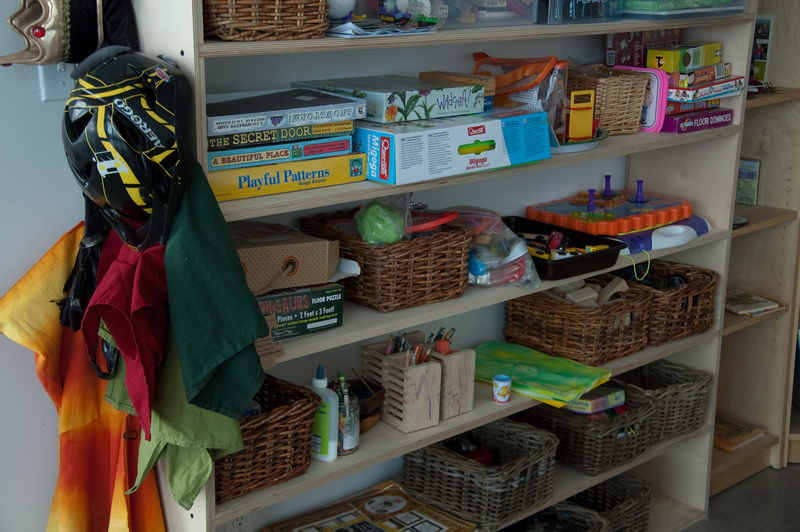 The smaller ones are great for storing art supplies, toys, activities…you name it these baskets can handle it. The larger ones on the bottom currently store playmobil (there is a LOT of it) and another holds the school laptop. Life is good. Though my long term plans involve wall to wall ceiling height shelving and a purpose built art bench (ambition is good you know) I am more than happy with things as they are right now. 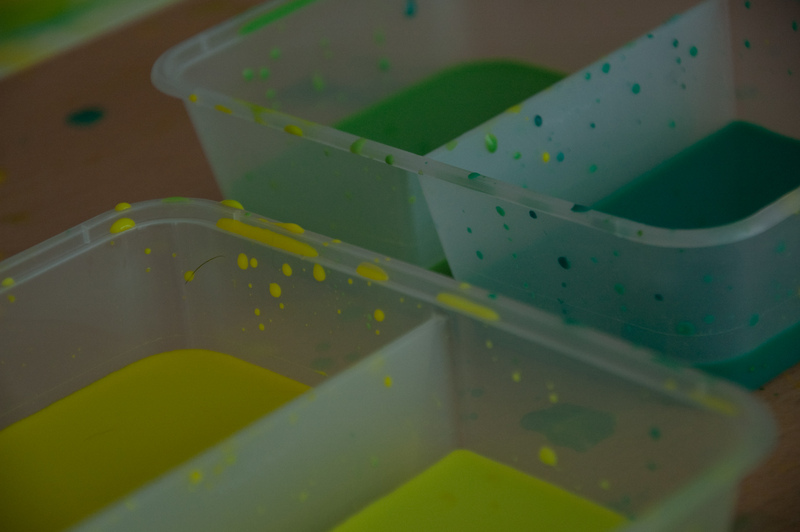 I’m already planning a reorganisation of our homeschool materials and have some plans for seasonal baskets, science baskets and fun collection baskets that will hopefully materialise some time in the future. But for now I am content. Unless Stephen fancies knocking up an art bench, in which case I will not say no. *This claim has not been verified by any external sources but is, however, true as this is Emmalina Land of which Emmalina is Queen and therefore the Boss of Everything. Shelves look great. How organised are you? If I walked into a room full of organised people they’d say, ‘look at her, she’s dead organised she is.” And they would be right. Oh, I need some shelves like those! We have a very long, rectangular rec room in our basement. One end is where we curl up on the couch and chairs and watch television. The other end is where things go to die. Shelving would give that end of the room purpose! Shelving would fill the vast empty space! 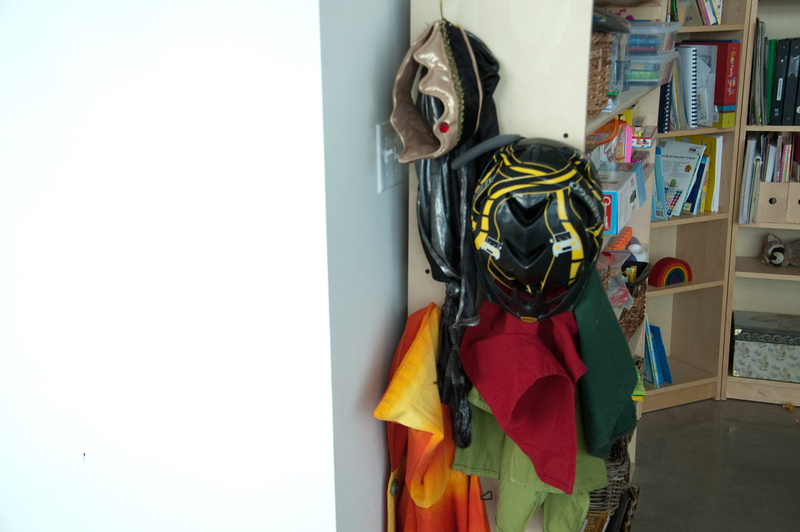 Shelving is awesome!